Beautiful Loft In Centre Of Zagreb. ZAGREB ROOFTOPS is lovely, artistic loft in super central location of Zagreb. 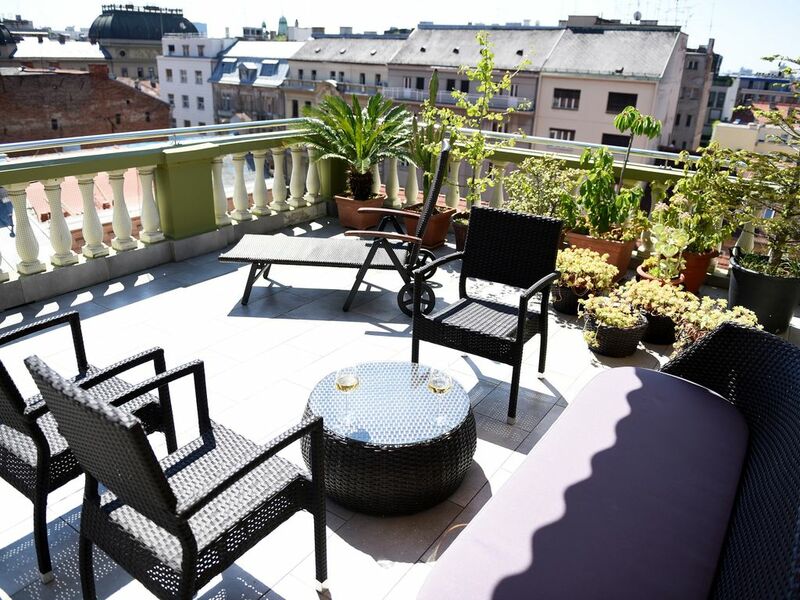 It has spacious, beautiful terrace that overlooks over Zagreb rooftops. It is located in city's main street, only 200m from the Main square and in the middle of all main attractions. The location between busy shopping and gastro area and lovely Upper Town (the oldest part of the city of Zagreb) full of history and culture. You are able to explore the city on foot. Hi! We are a couple with 3 kids, a daughter and 2 twin boys. We lived across Europe for more than 10 years and now we came back to our home town. It is really great location. Cousy and warm. The best thing of all is the terrace overlooking the Zagreb rooftops. Unique wive over the city while chilling over a glass of wine and even barbecuing. Bathroom has a shower and a bath tub. Toilet. There is an elevator that goes until 3rd floor so you need to walk a few more steps to the apartment. Quirky, clean, spacious and in the perfect location for visiting Zagreb. Great views from the rooftop area and with everything you need inside. Parking could be challenging but if you get a park you won’t need to drive anywhere. The apartment is in walking distance to all of Zagreb’s sights. This was in the middle of the centre of Zagreb and within walking distance from everything this city had to offer. Shopping downstairs. there is a small lift so you don't have to walk the whole 4 stories. Loft apartment was beautiful and spacious for all of us. Air conditioning was perfect and worked well. Lana was a perfect host and gave us all the information we needed to make it a pleasant stay. We had some English Channel tv so the teens were happy to have that. There was live music playing on the weekends and I sat outside on the rooftop listening with a bottle of wine. Perfect for a couple with kids or a group of friends. I will definitely go back and stay here next trip to Croatia. Fantastic apartment and a great location. This spotless apartment is artistically appointed and every detail is considered including fluffy towels, soaps, shampoos and enough coffee to last your trip. That said, you'll want to get out and enjoy Zagreb's coffee culture. It sits just below Gornji Grad (Upper Town) in a hip little spot with beautiful views of the city. Lana was wonderful in directing us to nearby restaurants, and was otherwise very accommodating. Highly recommend. Lana was very helpful and the loft is very well located. Eine sehr schöne,saubere Wohnung mit herrlicher Terasse mitten in Zagreb! Nur zu empfehlen! Thank you for being such a great guest!! !